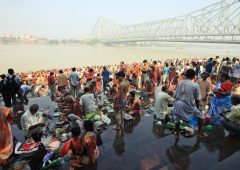 Kali Puja in 2019/2020 - When, Where, Why, How is Celebrated? Kali Puja is a holiday which celebrates the goddess Kali on the new moon of the month of Kartik – which is usually around October or November on the Gregorian calendar. It is also a holiday which falls on the Lakshmi Puja day of Diwali. While many of the people in Nepal and India will worship Diwali on this day, the Assamese, Bengalis, and Odias worship the Goddess Kali. While many festivals in India and Nepal go back to ancient time, the same thing can’t be said of Kali Puja. During the 18th century, it was introduced to Bengal by Raja Krishnachandra of Navadvipa. From that point on, and all through the 19th century, this holiday continued to become more and more popular. Now, it is a holiday that equals Durga Puja in size and enthusiasm in Assam and Bengal. Kali is a goddess which is most often seen as a slayer of the forces of evil. In one of her most famous legends, Durga wounds the demon Raktabija with a variety of different weapons in an attempt to destroy him. However, she soon realizes that she didn’t make the situation better but only made it worse. That’s because with every drop of blood she spilled, a fully-grown version of Raktabija formed out of it. In fact, there were so many that the battlefield was literally filled with clones of this demon. However, just as things began to look bleak, Kali suddenly burst forth out of Durga’s forehead and she was armed with both a sword and a noose. Kali then proceeded to slay all of the demon clones and when she was done, she dances on the corpses. On Kali Puja, many devotees of Kali will honor this goddess by decorating their homes and equipping them with shrines to the goddess. During the evening hours, she is worshiped using mantras and Tantric rites and is offered red hibiscus flowers and various food offerings which may include lentils, rice, meat, and fish. Sometimes, devotees will ritually sacrifice animals on this day and offer them up to the goddess, although that practice has begun to diminish over the last few years. All over the country, temples and shrines display one of the most prevalent images of the Goddess Kali. She is shown with a garland composed of nothing but the heads of all of the demons she has slain through the millennial and with one of her feet on the chest of Lord Shiva – holding him down. She is often also portrayed with a sword in one hand and a noose in another. As people do in their homes, they will often leave offerings of sweetmeats, rice, lentils and red hibiscus flowers at these images. Where is Kali Puja celebrated?